Last Saturday at Hokie Bugfest, we launched our Curriculum Kits (above). These kits contain material for incorporating insect biodiversity into your K-12 science curriculum. The contents include insect specimens (butterfly, beetle, fly, wasp, and katydid), a Golden Guide to Insects, a Rite-in-the-rain field notebook, collection vials, 5x and 10x magnifying lenses, a VTEC sticker, and a companion field guide. The companion field guide follows the Virginia Science Standards of Learning for grades K-12, and many of the activities in the guide are adaptable to the different grade levels (download here). 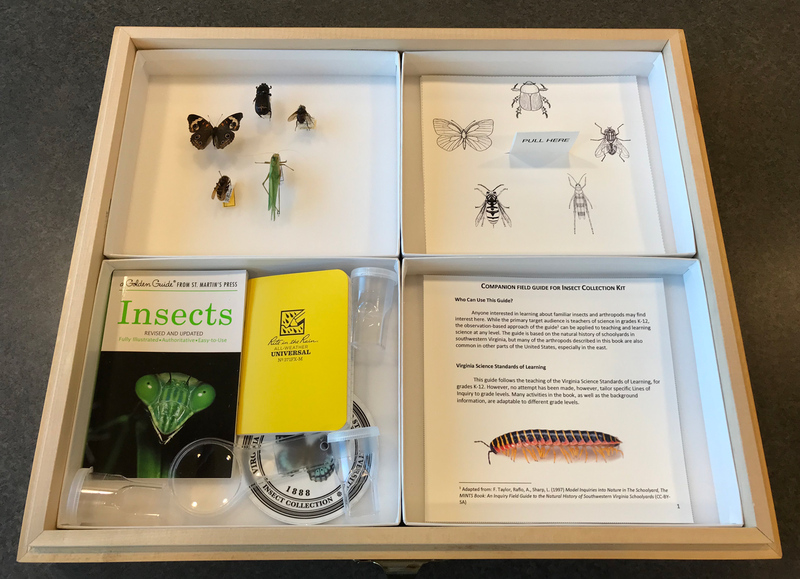 If you are K-12 teacher in Virginia interested in including insect biodiversity into your curriculum, the kits are available on loan, and contact Dr. Paul Marek for more details (email: pmarek@vt.edu). This entry was posted in Uncategorized and tagged collection, curriculum, natural history, NSF. Bookmark the permalink.